A Pennsylvania teacher is currently under investigation after a video of him performing Nazi salutes under the stage name “Blitzkrieg the German Juggernaut” went viral. An Ohio man driving a Uriah’s Heating, Cooling and Refrigeration van was captured on camera repeatedly calling a black driver a “n***er” for honking at him at an intersection. After the French president reacted to an incident involving his former security aide Alexandre Benalla, who was accused of hitting a May Day protester, by taking the blame for it and criticizing the media, rival politicians slammed the move as provocative and dangerous. As World Wrestling Entertainment (WWE) announces its first exclusive all-women event, wrestling fans await with bated breaths the possible battle between two gorgeous wrestling legends. 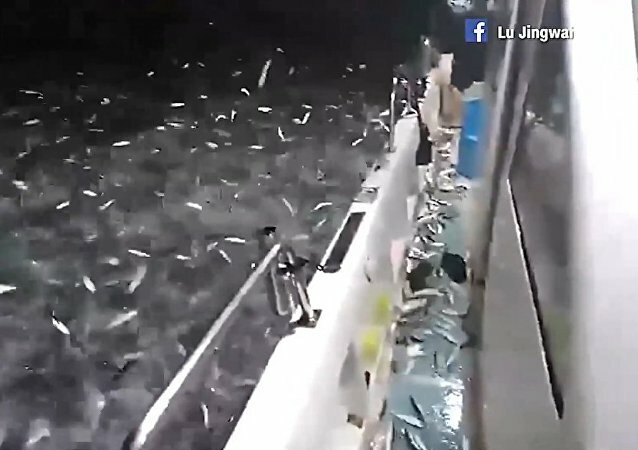 The fishy phenomenon off Taiwan's coast that made the water's surface "boil" and amused local fishermen was likely caused by a major threat. A catamaran carrying 52 people caught fire when it hit another vessel near a small island near the coast of northwestern Spain. A young Swedish woman took matters into her own hands Tuesday and stood up to both the Swedish state and airline authorities in defense of a man being deported to Afghanistan on the same flight as hers.